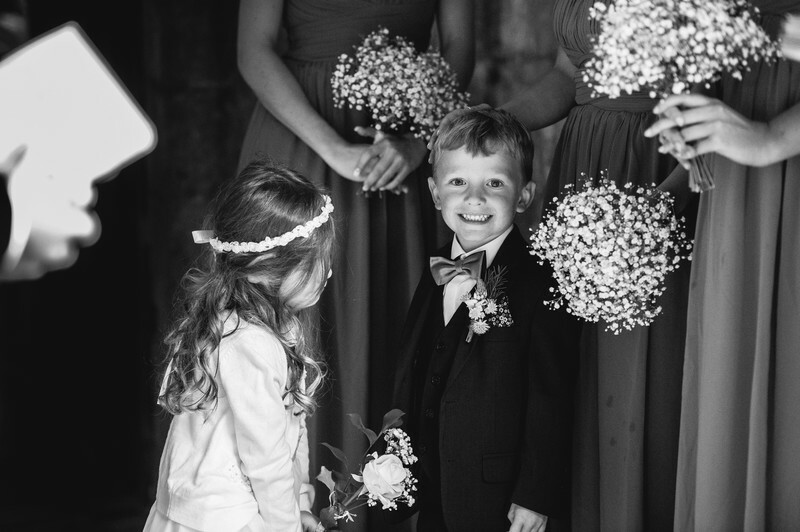 Most people will agree that weddings are largely about the bride, but this page boy completely stole the show! Andy and Heather both got ready in the morning at Norton Grounds Farm. Andy and the groomsmen looked after the young page boy, the son of the bride and groom, for most of the morning, before he made his way over to the bride and bridal party. 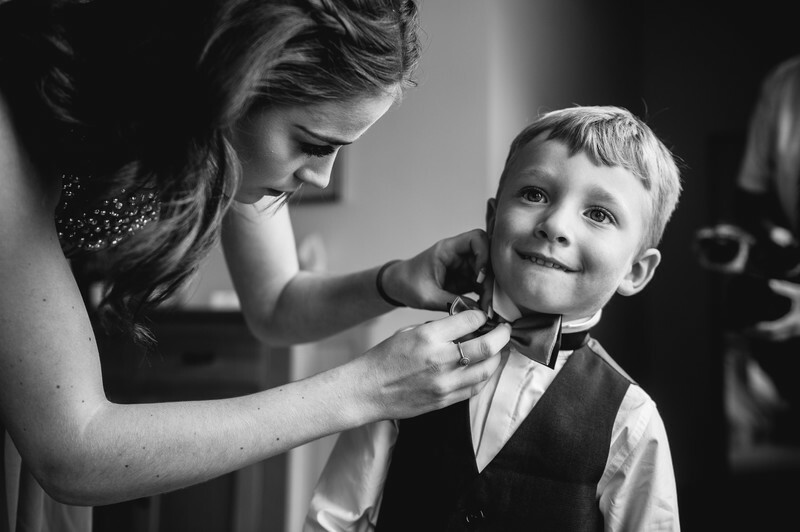 This was my first photograph of him - having his bow tie tightened by one of the bridesmaids. That smile won everyone over instantly, and I was hoping to see more of it as the day progressed. From Norton Grounds Farm we moved to St Egwins Church in Honeybourne near Evesham, for the church service. By the time I arrived, the groom had been at the venue for a little while and the groomsmen were already handing out orders of service to guests who were eager to get to the wedding on time. When the bride was due to arrive, the bridesmaids and pageboy made their way into the entrance of the church. They didn't venture too far outside as it had just began spitting with rain. I talk a lot about how being noticed at a wedding can change the photos just by you being there, and that's what happened here with the main photo. Usually it's a problem if you're caught pointing a camera at someone - they usually look away quickly or feel like they need to strike a pose. I think I was incredibly lucky that at the time the page boy noticed me, he was already cracking a massive smile which he kept for a second, allowing me to get this wonderful image of the happiest page boy I've ever met.